Then comes Class 1 Trio No.160 where Ju Te Xiang was the winner with an excellent score of 3.5/4 against Chris Kent and Raymond Cox. Ju receives 2 more BCM Points and has already qualified for Class 2. Now we are on to Class 2 Trio No.84 where Richard Akrill won with a score of 3 points against Michael Farmer and Stephen Woodhouse. Richard receives 4 BCM points and is promoted to Class 3 and the possibility of qualifying for a Webserver Trios Championship Semi-Final. And finally we have Class 3 Trio No.39 where Trevor Carr prevailed in a very tight match with Dr. Mark Wilson and Edmund Foulds. Trevor received 3 BM Points. Both he and Mark will be playing in Championship Qualifiers next time round. Edmund returns to Class 2 for his next Trio. Three Trios have been decided this month – one in each Class. We will start with Class 1 Trio No. 158 which has been won by Raymond Cox and David Elwood jointly. Raymond has now achieved the 20 points needed for the BCCA Candidate Master Title, David is now on 12 points – just 8 more to go. Finally, Class 3 Trio No. 44 has been won by BCM Gary Maguire in a close fought battle with BCM David Grobler. Gary clinched the win by 1/2 a point and receives 3 BM Points taking his total to 6. Both Gary and David are now playing in Trios Championship Qualifiers and may well meet again in a Semi-Final. A Clash of the Titans in this year’s Gambit and Counter Gambit Tourneys! Results I’ve been eagerly awaiting! 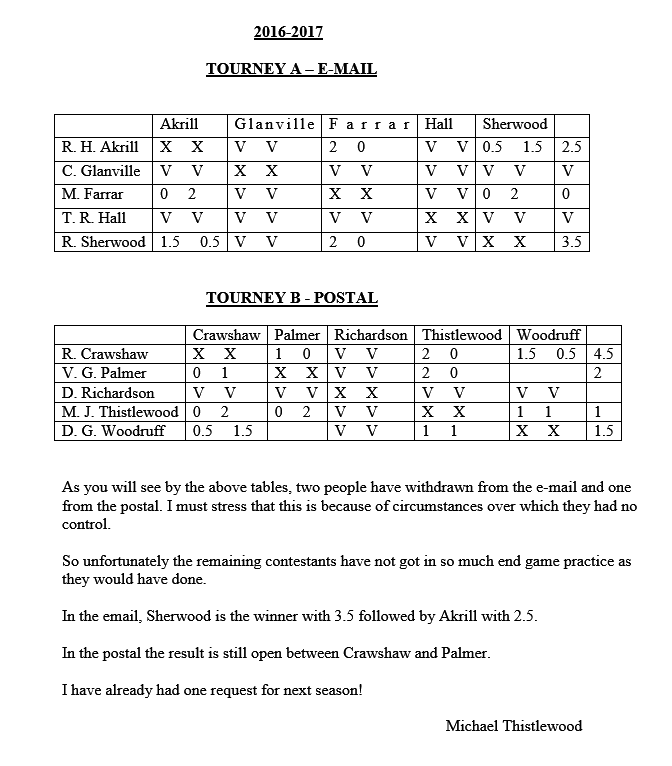 Russell Sherwood has dominated both these e-mail events in recent years. Likewise Derek Gallimore has dominated the postal sections of these events over many years. With the closure of the postal section this year, however, Derek entered the e-mail tourneys thus offering new and strong opposition for Russell. So who would take the honours this year? It could not be closer! Congratulations to the Titans and to the other competitors who played their necessary part in deciding the outcome. BCCA/C3/Tr48 has been won by Antony Copsey with a score of 3/4 against Frank McMahon and Raymond Burridge. Antony has been awarded his 3 BCCA Master Points. BCCA/C1/Tr147 has been won by Michael Farmer with a score of 3/4 against Lea Hudson and Raymond Cox. Michael is promoted to Class 2 and awarded 2 BCCA Candidate Master Points. Keith Kitson finished in 2nd place. The 4 Candidate Master points thus awarded to Keith take him over the 20 point barrier & he is now awarded the BCCA Candidate Master Title. Congratulations to both Dawn & Keith!